Ease back and let the soothing ambiance of the Maldives wash over you while you enjoy the luxurious amenities of the Kanuhura Maldives. 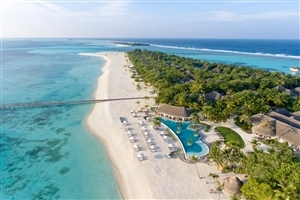 Settled atop a secluded Maldivian Island, Kanuhura Maldives invites travellers to indulge in the soothing ambiance and lavish comforts of a unique tropical oasis. Set on one of three private islands, guests are more than welcome to utilise all three for a romantic getaway, and with Kanuhura itself surrounded by soft-sanded beachfront, guests can explore all facets of the island with ease. Designed with Bohemian Castaway Chic elements and featuring a total of 8 in-house dining venues and bars, this is one paradise that is sure to impress. Settled atop a secluded Maldivian Island, the Kanuhura Maldives invites travellers to indulge in the soothing ambiance and lavish comforts of this tropical oasis. Surrounded by beauty and splendour on all sides, this idyllic escape is fully equipped to entice even the most discerning of travellers, hosting everything from a spa and fitness centre to gorgeous beachfront vantage points and an outdoor cinema. Choose from a number of plush-filled suites and villas, savour the flavours of the in-house dining venues and take in the sights and sounds of the Maldives at this unforgettable utopia. The Beach Bungalow offers guests 75sqm of accommodation space beautifully designed with elegant furnishings and natural elements further enhanced by views overlooking the sea. 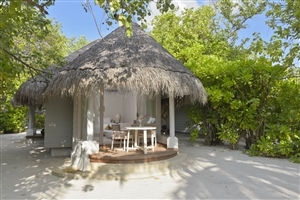 The bungalow features a covered deck and provides direct access to the beach for an enhanced occasion. The Beach Villa offers guests 90sqm of accommodation space fully fitted with an array of lavish amenities inspired by the natural surroundings that come accompanied by gorgeous views of the sea. 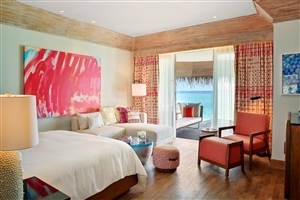 The villa features a private veranda that grants direct beach access and showcases sunrise views. The Water Villa offers guests 140sqm of accommodation space situated on stilts over the serene lagoon, bringing the beauty of the ocean closer than ever before. 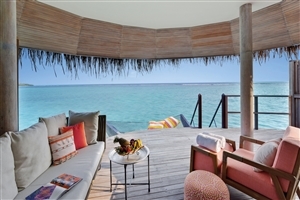 The villa features a private veranda that showcases sunrise views over the Maldives. The Beach Pool Villa offers guests 120sqm of accommodation space that exudes luxury with its plush comforts and stylish designs throughout. 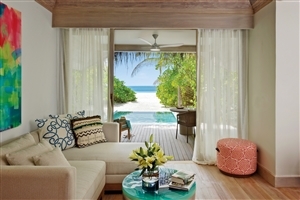 The villa features a private plunge pool and a veranda that showcases sunset views over the Indian Ocean. 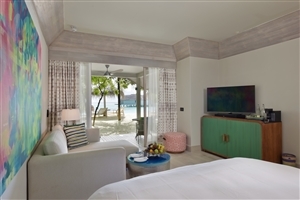 The Water Pool Villa offers guests 165sqm of accommodation space situated on stilts over the turquoise waters of the lagoon, providing private access to both the beach and lagoon for an enhanced occasion. 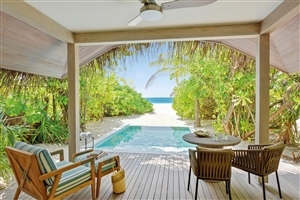 The villa features a private plunge pool and a veranda that showcases gorgeous sea views. The Retreat Beach Pool Villa offers guests 290sqm of accommodation space that emphasises exclusivity and luxury, proving to be an idyllic setting for families and groups. The villa features a private veranda, a secluded garden and a soothing pool while boasting of sunrise and sea views. The Grand Beach Villa offers guests 270sqm of accommodation space where undeterred lagoon views, lavish comforts and natural elements come together. 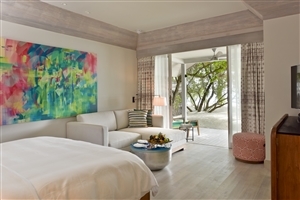 The villa features a living area and a veranda while also providing direct access to the beach and lagoon. The Grand Beach Pool Villa offers guests 250sqm of accommodation surrounded on all sides by the calm waters of the lagoon. The villa features a living area, a private sundeck and a personal plunge pool while also boasting of sunrise views. The Retreat Grand Beach Pool Villa offers guests 370sqm of accommodation space facing out towards the Maldivian atoll and exudes a soothing ambiance throughout. The villa features a living area, a private terrace and a personal pool while also showcasing sunrise views. The Retreat Family Beach Pool Villa offers guests 620sqm of accommodation space that sets the bar high for luxurious experiences for families in the Maldives. The villa features a living area, a veranda and a personal pool while also boasting of sunrise views. The Sanctuary Pool Villa offers guests 715sqm of accommodation space beautifully designed and furnished to accommodate large travelling groups and families. The villa features a living area, a dining space, a veranda, a private pavilion, a garden, a BBQ area and a personal pool. Bottega – Revel in the fine flavours of traditional Italian favourites infused with modern ingredients at this welcoming eatery. Veli –Spice up your holiday with some Asian-Fusion cuisine, enjoyed on the beach front offering a unique dining experience. Chef’s Herb Garden – Tempt your palate with fresh ingredients and local herbs at this communal venue. A Mano – Enjoy a variety of flavours including pan-Asian cuisines and international dishes at this all-day dining venue. Drift – Marvel at the secluded views of Jehunuhura Island while enjoying grilled delights in this secluded, tropical gem. 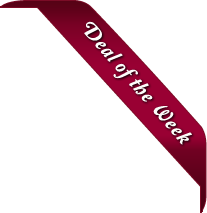 Deli – If you’re in need of something light, head to the Deli. It offers a host of delicious teas, freshly brewed coffees, sandwich and sweet-tooth delights. Cowry Club – Modern lounge by day, jazzy bossa nova by night, this infinity pool bar offers an array of local and international cocktails. Iru Beach Lounge – Experience the Maldivian sunset in a laid back chic setting with the best lounge sounds and paired cocktails.